The indicated times are guideline times for your guidance. Since we set our departures individually, we also like to offer more cruises if required and we also may have later departure times. Just call us if needed. 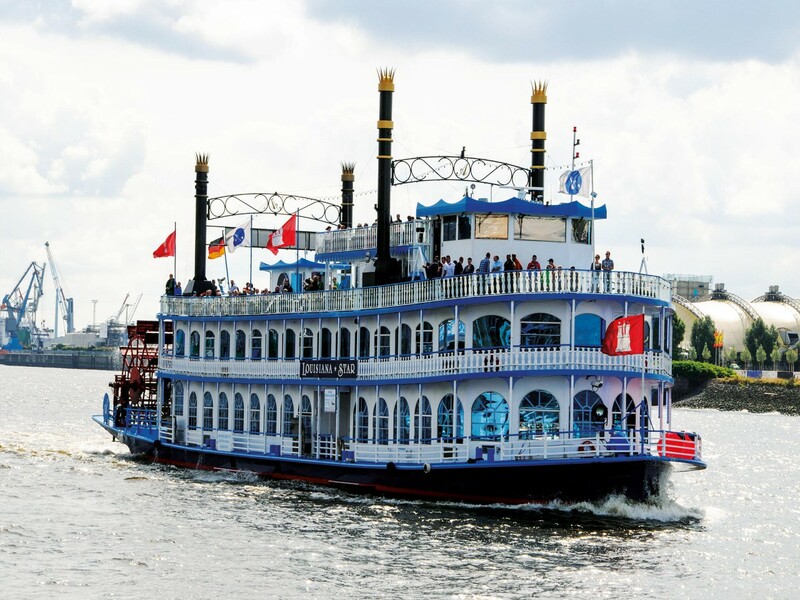 With our entire fleet of quaint or modern harbour tour launches as well as comfortable and spacious lounge ships, we offer you the grand one-hour harbour boat tour through the Port of Hamburg daily. Whether it is on a launch trough the undisputed heart of our port, the historic Speicherstadt, and to the large container terminals or it is a cosy lounge ship down the Elbe and through the various docks with the huge container terminals – the Port of Hamburg with its many faces is always a great experience. For more than 20 people, please register in advance on +49 40 31 78 22-0. Online booking possible at any time via www.eventim.de – just use the EVENTIM button. Our passenger ships MS RIVER STAR and MS HAMBURG as well as our stern wheeler MS LOUISIANA STAR can be reached barrier-free via a gangway and have corresponding sanitary facilities. Due to the conditions on site, we cannot tell you exactly in advance at what times the above-mentioned ships provide service in the port on the harbour tours (no fixed departure times). Our luxury launches as well as our traditional launches are not barrier-free. Further information and a comprehensive personal consultation you will receive from our event team, also for your private or business events exclusively on one of our ships – we are looking forward to seeing you! The tickets are so-called OPEN TICKETS, which are not bound to a specific date, but are valid for participation in all one-hour harbour boat tours on our maritime launches and large passenger ships (departure times see above). Furthermore, please be aware that the sending of the tickets and a payment of these per bank transfer takes a processing time of about 3 working days – thank you for your understanding. The Hamburg Board Party – every Saturday!